The Jeep Wrangler (JL) comes in a modern design. From model year 08/2018, the model with its significant corners and edges is now available in a sporty look, which of course is still strongly oriented towards the evergreen and its characteristic look. For many years, the Jeep Wrangler has been a popular vehicle for off-road tours and is also used increasingly in city traffic. The Wrangler is also excellently suited as a towing vehicle and can prove its pulling power with the matching trailer hitch. In our assortment we offer a suitable detachable trailer hitch for an easy retrofit. Our trailer hitch ca easily be operated by means of a rotary knob of the system 2040 and can be removed at any time. The towbar does not intervene in the high-quality appearance of the Jeep Wrangler (JL) and is also easy to use. 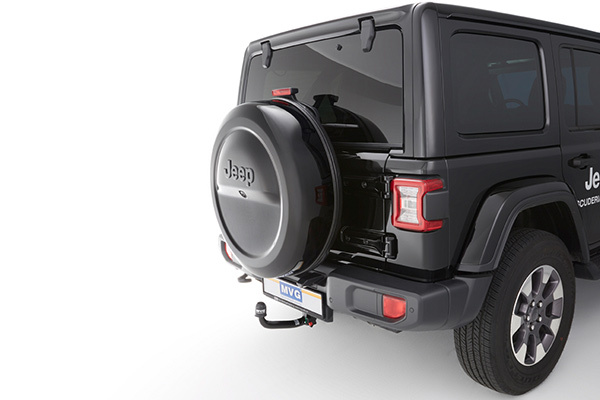 The towbar for your Jeep Wrangler (JL) from 08/2018 can be found in our MVG-shop. The item number is 0849 AS. In an accident, there are many points that shoot through your head and that you have to pay attention to. The trailer hitch (maybe) does not always come to mind at first. Of course, driving yourself in or against the front of the car will obviously not affect the towbar, although it will certainly damage other areas of the vehicle. Thus, you will have to worry about the trailer hitch when the rear of the vehicle is affected in the accident. So if somebody drives into the back of your car or if you drive too far when parking and end up in the wall, then you should always think about your trailer hitch and question whether it can still be used. In the event of a collision on your vehicle and thus also on your trailer hitch, you have to act. A trailer hitch can not be repaired. This is because repairs and modifications of any kind are inadmissible and the approval, which we receive for your trailer hitch and send you, is not valid anymore after an accident. In addition, there are product liability reasons that make it necessary to replace the trailer hitch. If someone crashes into your car frim behind, then possible damage to the trailer hitch is often not really visible. Sure, when the paint is off, the damage does not seem that bad at first. However, you can not detect any damage to the cross member or the side parts with the naked eye. We strongly advise against the repair on your own, not only for the reasons already mentioned. A self-repair does not fulfill the necessary hardening and machining processes which ensure the tensile strength and stability and can not be met by you or in any workshop. If your rear end and thus your trailer hitch has been damaged, you should no longer tow the trailer with the trailer hitch and replace it as soon as possible. In an accident, as we have outlined above, certainly the opposing vehicle is affected. Often it will be the case that your tail looks much more harmless compared to the front of the other party. Due to the trailer hitch on your car, the impact forces of the opponent on his car have a significantly stronger impact, so that his vehicle is certainly badly damaged at the front. But does the trailer hitch affect the liability of the insurance company? Currently there is no official and universal regulation. 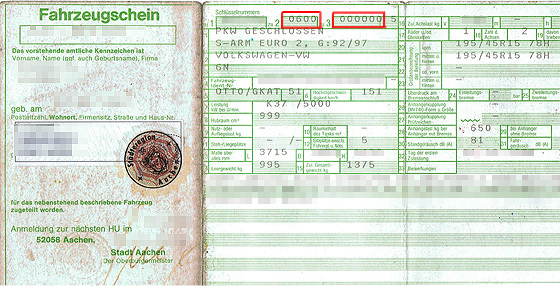 In the Road Traffic Licensing Regulations in Germany (StVZO) the following is stated in §30c: „[…] no part of the outline of the vehicles may protrude so that they more than inevitably endanger the traffic.“ That is, with a removable trailer coupling or even a swiveling model, the emergence would be avoidable. Therefore, we strongly advise you to have the two models attached or unfolded on the vehicle only if you need the towbar immediately. Otherwise, there may be difficulties with the insurance. The KIA Sportage enters the next round: In 2018, a new facelift model came to the market, which once again shows that the popular SUV is one of the most modern vehicles. The facelift inspires with an attractive look and a high level of comfort, also the SUV is well known as a towing vehicle. So that he can show his strength, we offer the right trailer hitch. Our trailer hitch can be easily retrofitted and has a removable system. If the trailer hitch is not needed, the ball bar can be easily removed at any time. This is easily achieved with a rotary knob. 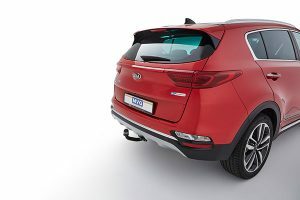 The towbar does not interfere with the high-quality look of the KIA Sportage and is also easy to use. The towbar for your KIA Sportage from 2018 can be found in our MVG-shop. The item number is 3133 AKS. A higher vertical load with the towbar than with the vehicle will be the case most of the time. The trailer hitch can usually withstand higher loads than the towing vehicle. Towbars made by MVG are tested for fatigue strength according to the European Directives 94/20 / EC, ECE R55 or Carlos TC. In addition, the towing hitches are always tested for maximum D values ​​and towing loads, so it can certainly come about that the hitch is approved for higher values ​​than a vehicle. The values ​​of the vehicles are dependent on various factors, the entire construction of the vehicle must be aligned with the values ​​specified by the vehicle manufacturer for reference to the vertical load, so that the vehicle „endures“ the acting forces during trailer travel. If you have a vehicle with a vertical load or towed load less than the value of the towbar, then you must comply with this lower value. The lowest value is decisive. Why is that so important? 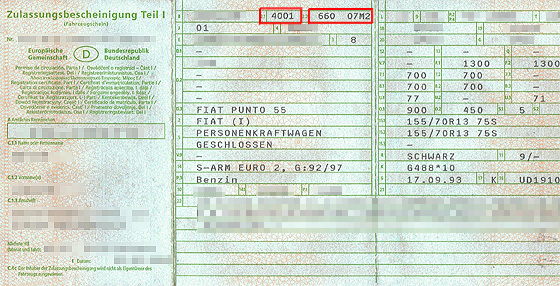 Assuming the values ​​of the vehicle are the lower values ​​and are not met, this can have different effects on the vehicle. As a rule, for example, the engine and the chassis are adapted to the trailer operation already in the development of the vehicles and included in the calculations. Thus, if the values ​​are not met or exceeded, this can possibly have an effect, for example, on the drive train, the chassis, the cooling system or even the transmission. Therefore, it is important to always follow the instructions of the manufacturer, in the manual for your vehicle you will certainly find information about it. The Chrysler Pacifica (RU) thrilled as a modern hybrid. Of course, the van can also be set up as a towing vehicle, of course, the right trailer hitch is essential. We offer you a practical detachable trailer hitch, which you can operate in a few simple steps and remove at any time. Operation is via a rotary knob, the trailer hitch does not interfere with the appearance of the Chrysler. 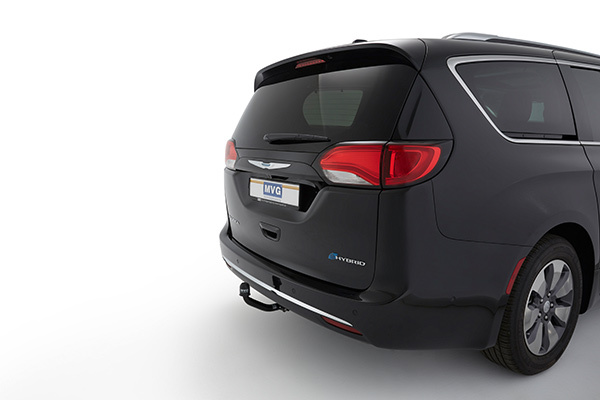 The towbar for your Chrysler Pacifca from 11/2016 can be found in our MVG-shop. The item number is 0848 A. Why is retrofitting with change plate practical? In some vehicle models, we also offer a practical system with removable disk in addition to a rigid or detachable trailer hitch . But what are the benefits for you and why is it advisable for some vehicles to opt for a system with a change plate? We always offer the replaceable plate system when the function and consequently also the use of the vehicle can be well supplemented by a jaw clutch. For example, with very powerful vehicles, as they are often used in forestry. Here are certainly the current pick up models, such as the Renault Alaskan and the Nissan Navara, to be named. In agriculture, these cars are often used. The trailers, which are used in the work in forestry and agriculture, usually have no ball coupling as you know them from the popular trailers. Instead, you have to work with a jaw or a bolt coupling. With a removable change plate system, this is easily possible. Because you have two plates, each holding a different trailer hitch for you. So you can of course on the one hand, rely on a normal rigid trailer hitch. On the other hand, there is also a plate, which is provided with a mouth clutch. You can then use these for the foot or bolt coupling of the trailer. If you want to switch between the plates, this is of course easily possible. You just have to pull a lever forward and then you can turn off your removable disk. Also, the assembly of the new plate is literally done in a jiffy, but you turn the plate simply on the base plate until the lever engages. The operation of the system with removable disk you can also look at the video once. If you want to retrofit a towbar, you should pay attention to a few details. Clearly, you want to be able to use the AHK for a few years on your current vehicle and you do not want it to annoy you on a regular basis. Therefore, we have put together the three most important features that you should consider when choosing the towing hitch. Nothing is more annoying than constantly bumping your leg on the trailer hitch because you have forgotten that it is now on the back of the vehicle. Surely you will get used to it one day. Yet, if you are a habit and are bothered by something in your way, then you should think about a detachable or swiveling towbar. These are not permanently in your way and only need to be put into operation when you really intend to use them. This way you save not only trouble, but also dirty trouser legs, if, after retrofitting you forgot about the towbar again. If you are retrofitting a trailer hitch and it is not exactly rigid, then you should make sure when retrofitting that you get along well with the operation of the trailer hitch. With our detachable trailer hitches, you just have to turn one wheel aside and turn it to remove the ball rod. During assembly, you only need to guide the ball rod into the receptacle until it snaps in by itself. Even with the swivel trailer hitch from us only a few steps are necessary. So you have to operate the trailer hitch as described for the removable version, if you want to dismantle the towbar. If you have operated the wheel, the towbar „falls“ down and you only have to bring it up to its resting position. If you would like to put the towbar back in operation, you will move the lever of the rest position to the side so that the ball bar „falls down“ once again. Then you only have to grasp the trailer hitch and guide it to its correct position. Here, too, the towbar locks itself in. So you see, the operation of our towbars is designed as easy as possible for you, we put a lot of value on it in the development and construction. Nothing is nastier than a large section in the bumper, if you retrofit a trailer hitch. It is by no means absolutely necessary to reckon with a section when retrofitting. Our trailer hitches are designed to come out under the bumper and thus run around it. A section in the visible area of ​​the bumper is therefore not required when retrofitting with MVG trailer couplings. When buying your trailer hitch you should also pay attention to this, certainly you would like to make on your vehicle no major interference with the optics. The Seat Arona is a modern cross over SUV, which can convince by its design. The popular SUV is also ideal for driving with the trailer or the rear bike rack. Of course, the right trailer hitch must not be missing so that you are ready for your next bike trip. Therefore, in our assortment we not only offer a rigid trailer hitch but also a practical detachable system. The detachable towbar is easy to use and can be mounted and dismounted at any time. The operation is done via a rotary knob and is possible in a few steps. Our towbar requires no intervention in the modern design of the Seat, our AHK uses the original cutout. 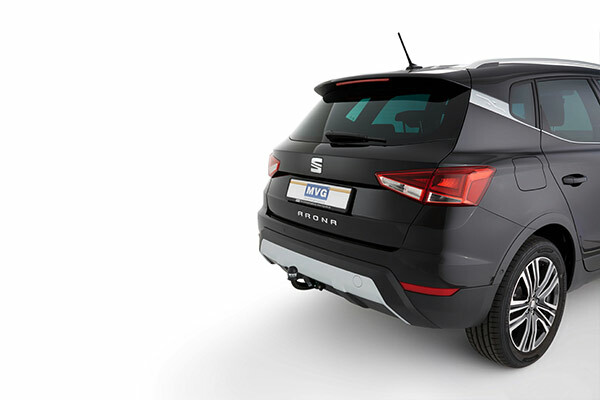 The towbar for your Seat Arona from 11/2017 can be found in our MVG-shop. The item number is 0798 AS. Before driving with the trailer, it is important to also deal with the cargo. Finally, this can affect the driving behavior of the trailer. If you’ve gone through the checklist, you’ll also be dealing with the cargo and loading it within the trailer. Maybe you have already loaded the trailer, but maybe you also have to accommodate some parts. It is important to be clear about a few points. The center of gravity of the trailer is usually centered, slightly ahead of the axle. It is important when loading not only to know where the center of gravity is, but also to plan it when distributing the load. Above all, you should pay attention to distribute the load evenly at the center of gravity and around the center of gravity. Better you load the goods a little further forward than too far behind. If you overload the rear part, there will be a negative vertical load, which can cause the team to skid during the ride. In addition, you should make sure that large, heavy cargo pieces are stored as far down the ground as possible. A lying cabinet is easier to transport than a standing, finally, this cabinet springs from movements and can move its own focus unintentionally, for example, when driving around a curve. On the other hand, if the cabinet is transported horizontally, the center of gravity of the cabinet is also significantly lower, significantly reducing the handling of the trailer and the entire yoke. It is also important that you always secure your cargo well. Lashing straps and nets are a good way to secure loads, and in the worst case, even the smallest of loads can become dangerous missiles. Even cartons with books in a move are heavy and can adversely affect the trailer, so you should load them in the trailer safely so that the range of motion is limited, in case of doubt, it is best to use safety straps.